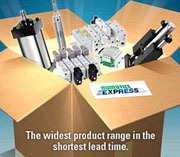 Numatics Incorporated is a leading manufacturer of pneumatics and motion control products. Their broad spectrum of custom developed products and application components have made a significant impact on pneumatic innovation as well as pneumatic and motion control technology. THigh flow rate 11mm pneumatic valve. 4 way solenoid air pilot actuated valves including double 3/2 function. Available in manifold with Fieldbus, compatible with all industrial protocols (DeviceNet, Profibus-DP) and leading Industrial Ethernet protocols (EtherNet/IP, EtherNet/IP DLR, Profinet). Numatics 502 Series valves (18mm) have up to 30% greater flow than the products they replace — making them ideal for design engineers desiring a more compact valve, or for those who want to increase a machine's work capacity using the same size valve. These new directional control valves offer the greatest range of pneumatic ‘sandwich' components (pressure regulators, pressure shut off, exhaust flow controls) that allow an almost infinite number of configurations based on the customer's requirements. The 502 Series joins a family of high-performance sub-base mounted directional control valves (501 Series and 503 Series) that have higher flow rates; less power consumption; and exceptionally easy on-site installation, configuration, and modification. The Numatics 503 Series valves deliver the industry’s highest flow rates per valve size. This enables design and specifying engineers to use smaller, lower-cost valves and components that do more work with less air, energy, and cost. Numatics 503 Valve series provides higher flow and higher reliability in one versatile valve platform. Available in dual 3-Way and 4-Way solenoid air pilot actuated valves the 503 Series offers manifold or individual base mountings, proprietary or ISO 15407. 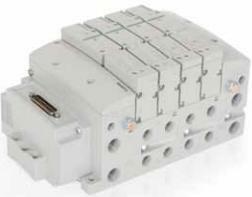 Numatics 503 series valves are compatible the Numatics G3 Fieldbus Electronics Platform. Numatics G3 Fieldbus Electronics have an innovative graphic display for easy commissioning, visual status, and diagnostics. The G3 Series product line is a completely modular system. All of the G3 electronic modules plug together, via mechanical clips, allowing easy assembly and field changes. This makes the system highly distributable. Additional flexibility is incorporated because the same modules can be used in either centralized or distributed applications. 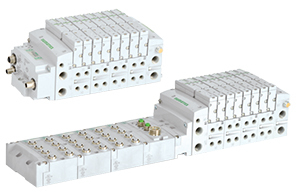 The G3 electronics interfaces with the highly modular Numatics 500 Series, generation 2000 Series, ISO 5599/2 and ISO 15407-2 Series valve lines to further enhance the modularity and flexibility of the entire system. CC-Link IE Field™ is an open standard 1 Gbps Ethernet Manufacturing network that enables seamless data communication from the plant-level enterprise network to the production floor network. Numatics' G3 nodes for CC-Link IE Field have an integrated graphic display and are capable of addressing combinations of up to 1200 outputs and 1200 inputs. CC-Link IE Field™ is based on 1 Gbps Ethernet standards and complements them with specific protocols and mechanisms to achieve real time performance. 580 Fieldbus - Electronics Made Easy! 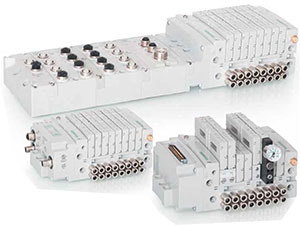 Numatics' affordable electronics platform for the Numatics 501, 502 and 503 Series valves. 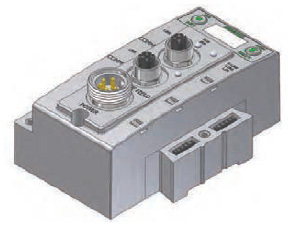 The 580 node platform allows the use of a fieldbus network to control the valve manifold. Its compact footprint makes it highly functional for in-panel environments. The 580 platform incorporates a plain-language digital display and diagnostics that indicate status for easy configuration and commissioning. 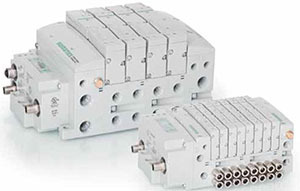 The 501 Series directional control valve and 580 electronics platform are ideal for applications in the life science, food and beverage, high-technology, and light packaging equipment industries. Asco's Numatics 503 series valve manifold is designed to help the design engineer satisfy the Machinery Directive 2006/42/EC and comply with ISO 13849-1 while eliminating the components and complexity found in discrete safety circuits. The zoned safety concept is an integrated approach to machine safety and control that greatly simplifies the design of a redundant pneumatic safety circuit with a manifold system. The Numatics 503 Series can create up to three independent electro-pneumatic safety zones, while also allowing independent non-safe sections to co-exist within one manifold assembly. The operator does not have to shut down the entire machine by releasing compressed air with a redundant safety/control dump valve. Instead, the Numatics 503 Series valve manifold can be configured to shut down air and power only to the group of valves that controls the machine’s motion in the operator’s vicinity. With their rapid assemble-to-order capability, Numatics now offers the broadest line of pneumatic products and the fastest lead times of any quick-ship program in the industry. Numatics Express gives customers the choice of more than 1,000 cylinders, linear slides, valves, regulators, and manifold assemblies with millions of available configurations -all for shipment within 2 and 3 days. Numatics Express products can be ordered and configured in minutes using Numatics' online catalog and dynamic product modeling tool.